The plugin allows forum's registered members to attach any amount of any kind of files to their posts. Uploaded files may be opened or downloaded regular way clicking on their links. Extension is designed to create thumbnails from JPEG, GIF and PNG images, as well as resize too big pictures to the smaller dimensions. 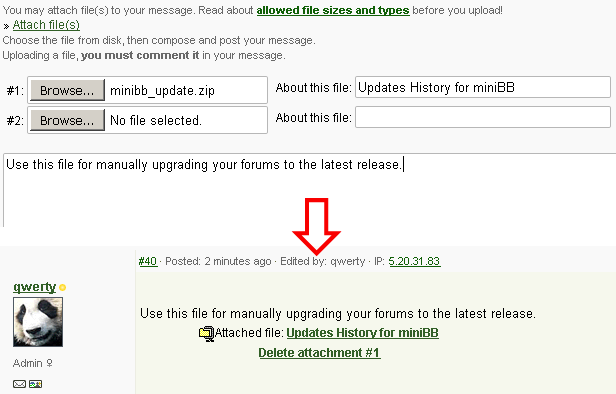 For the authors and forums staff it is allowed to delete the uploaded files anytime, edit their descriptions, also as attach new files to the older message. Near the message's posting form there will appear regular file upload boxes; the uploading procedure is available only to registered and logged members. File is chosen pressing the "Browse" button and then locating it on the disk; it is possible to specify short title/description for each file which could do a good job for SEO fans. It's not possible to upload a single file without writing the message's text, so all files must be properly commented, that should work for good forums content as well. The file will be uploaded at the same time, and pressing the same button as when you post the message. After a binary file is uploaded, it appears below the message as attachment with the proper icon; if the picture is uploaded, most likely it will be thumbnailed, so clicking on its thumbnail preview the plugin brings the pop-up window with the fullsize image shown. Uploaded files may be deleted clicking the appropriate link; editing the message it is allowed to edit files titles and add new files. Screenshot of the file upload boxes and a binary package attachment - click for viewing in full size. option to close pop-up images by a left/right mouse button click. 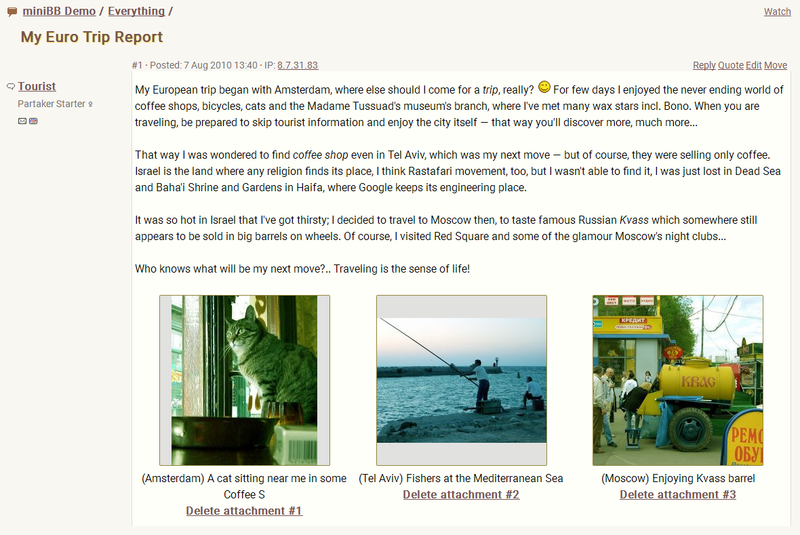 Screenshot of 4 pictures attached to the message - click for viewing in full size. This message can be checked live with fullsize pictures at miniBB Demo topic. Being as simple as possible this plugin is not designed to upload large files, and it doesn't provide a file upload indicator. It is commonly used for the web-style content only like small-to-medium archives, packages and pictures. If you would like to allow to upload big size files, check our File Bank extension. Read and ask more about the features of this plugin in our related forums topic. Amongst uploading each file there will be created a special data file with the ".php" extension, and if there is a picture uploaded, it could have up to 2 different thumbnail files. These files could be stored in one special folder with the proper permissions set, or in different folders where each of them corresponds to a forum's thread ID. That all means PHP on your server must be allowed to copy, rename and move the binary files, also to create the files with the ".php" extension, and most likely to create subfolders where all uploaded files will be stored. Sometimes it could be disabled if PHP is compiled to run in Safe Mode. Picture manipulation requires GD library compiled with PHP. Most preferrably it should have a version 2.x. Alternatively, the add-on may work with ImageMagick, providing the improved quality for images manipulation. Touch it before you buy! This plugin is available to test in action on miniBB Demo Forums. Since only registered users are allowed to attach files, first login with credentials provided on the starting demo page, or create your own account. 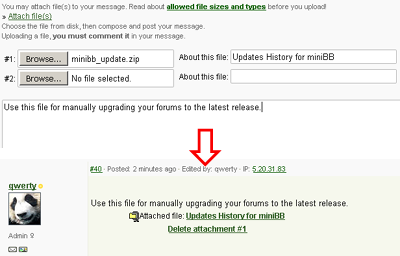 You will be able to upload files under "Everything" forum, creating a new topic or posting a new reply. Make sure to read file attachment rules before! You can't upload larger size files than it's allowed.